What is “Seaside Cash” mobile slot about? 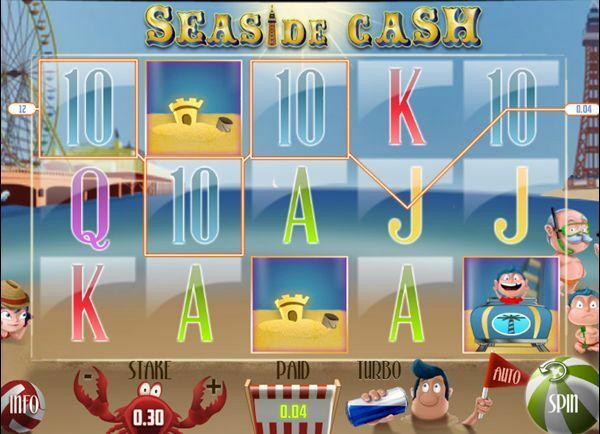 Nektan, a European games developer, has created Seaside Cash mobile, a 5-reel HTML5 video slot filled with summer holiday gameplay. Offering 30 paylines across 3 rows, the slot includes bonus rounds with expanding wilds, free spins, and multipliers, as well as a wild symbol during normal gameplay. The betting range is from €0.30 to €90 per spin and the fixed jackpot is up to €1,000,000. This game is designed to be played on any mobile device, including any iPhone, Android smartphone, or tablet, without the need to download an app. Seaside Cash is themed around an idealised family holiday to the beach. The reel background includes a Ferris wheel, a bright sun over the blue ocean, and a lighthouse tower. The characters in the game include a range of cheerful family members enjoying their holiday, and they appear as one big group on the reels as one of the highest paying symbols. Sandcastles and oysters with pearls also feature alongside traditional number and letter symbols. The overall effect is bright and cheery. The highest paying symbols in this slot are the images of holidaymakers and the small boy on the rollercoaster ride. The wild symbol also offers a similarly high payout. The wild symbol is the lighthouse tower, which is gold edged and has “Wild” written discretely in the corner. These pay out according to their own paytable if they appear 3 or more times, and can also substitute for any symbol except the bonus symbol to help complete a winning combination. If the tram bonus symbol appears 3 or more times, it begins a bonus round. The player selects from 3 ticket dispensing machines to determine which round begins. In the basic free spin round, the player is awarded a number of free spins with expanding wild cards, which means that a wild appearing on the reels will expand to fill the whole reel for the duration of the round to increase the chances of winning combinations. The number of spins is determined in a duck-shooting mini game, and a multiplier of up to 4x bet is awarded by hitting a “test your strength” meter. The look of the reels changes to indicate that this is a free spin round, taking on an arcade appearance. The Donkey Racing bonus round asks the player to select a donkey to race. The higher the donkey comes in the race, the higher the player’s winnings. The Seaside Spy bonus round has the player seeking hidden objects on the beach, as well as hiding family members in a style similar to “Where’s Wally?” children’s books. Points and multipliers are collected to be awarded as a cash prize at the end of the round, which has a 1 minute time limit. Full of bonus games and fun.